You know how I was saying on Monday that I didn’t have anything lined up to help those that might not get to have Thanksgiving at all? Well, things just fall into place sometimes. As I was checking my email yesterday in the nice cozy flannel sheets we just brought out of storage, I got an email from Community Plates calling for volunteers to deliver a large donation of turkeys to local shelters. Perfect! Assuming they weren’t already maxed out on volunteers by the time I replied, I’ll be shuttling some turkeys next Tuesday! Community Plates is an organization that coordinates volunteers to pick up excess stock from grocery stores daily, who then take it to a designated shelter or non-profit in need. I worked with them a handful of times over the spring and summer but had slacked off on signing up for food runs since, and this is a good reminder to focus on something other than my own to do list to contribute to alleviating a real issue. For those of us who are lucky enough to be having fun (yes, it’s fun, not stressful!) 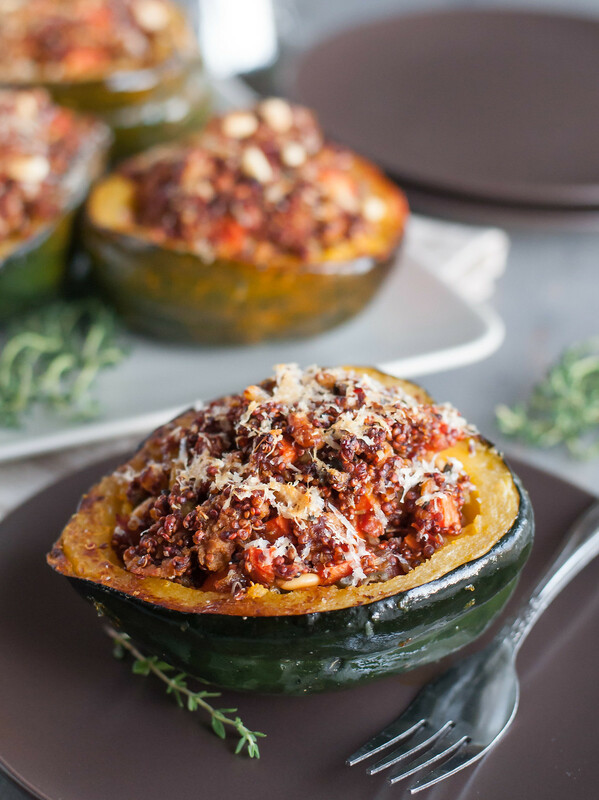 planning our own turkey day menu, this stuffed acorn squash makes a great side, or even main, for just about any special diets you have at your table. It can be made with or without meat, dairy free, gluten free, vegan, vegetarian, nut free, or even nightshade free, all without sacrificing any of the flavor that comes mostly from whole plant foods like balsamic vinegar, capers, fresh and dried herbs, and vegetable aromatics. My version this time was “nearly meatless and gluten free”, as I used Field Roast vegetarian Italian sausage, made with eggplant, garlic, and red pepper. The sausage contains some wheat, but it’s so flavorful if you’re a sometimes wheat-eating vegetarian, and it crumbles and chews like “real” sausage. I’m just a little bit of everything these days I guess, which is why I like to include lots of nutrition options and focus more on the flavors in my recipes. The “rustic” side of this dish really comes through in the chunky filling, which lets you taste and identify each ingredient you eat. The browned, cut squash adds a gorgeous quality, too, but I will admit, I took an extra step to get it. March 27, 2015 update: the recipe has been updated for a squash roasting method that simultaneously browns the squash and imparts a deep, rich flavor. Props to Damaris for her always-spot-on culinary tips. Since time is at a premium on Thanksgiving Day (or, let’s be honest, most weeknights), fully assemble the stuffed squash up to two days in advance, then leave at room temperature for 30 minutes and bake as directed in the recipe. 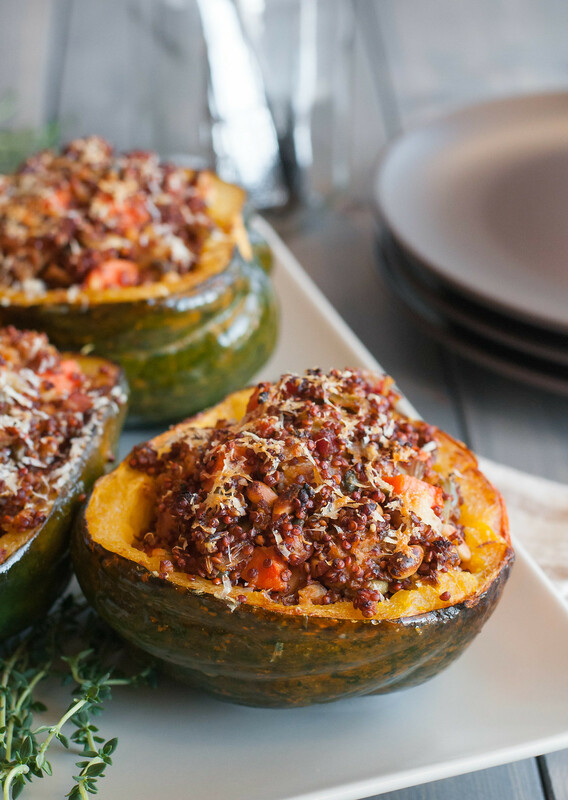 Stuffed squash achieves such a nice balance between sometimes-bland winter squash and a totally dressed up filling. I like to scrape a little of the tender squash from its shell with my fork, then, on top of that, scoop a bit of filling. Voila! Perfect bite. If you tried acorn squash on its own, you risk being significantly underwhelmed in the flavor department. The pretty yellow color is nice, but it’s bland and kind of stringy. So what are you supposed to do with the leftover squash that you’ve scraped to thin the shells before stuffing your cooked squash? The first time I made these, I tried to turn it into acorn squash and carrot soup. I’m sure it could have been good, but mine failed somewhat miserably, still bland and speckled with unchewable whole thyme leaves. Yuck. This time around was much more successful, and simpler. Heat squash flesh with a little almond (or other) milk in the microwave or on the stove, then blend to a baby food-like puree with salt, pepper, and olive oil. The blender broke up those fibers, I got the right amount of seasoning in every bite, and the olive oil added a nice, full finish to actually set it apart from baby food. Mixing in a little maple syrup and blue cheese may even deem it Thanksgiving table worthy. 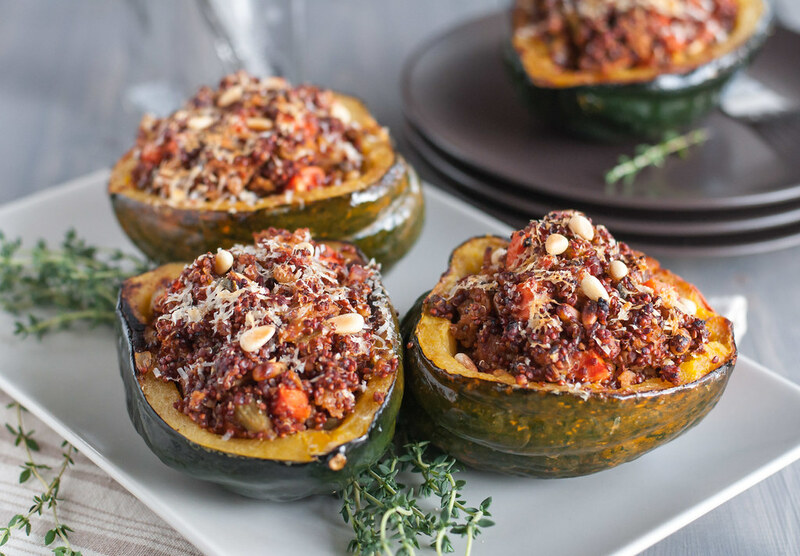 Although this stuffed squash is a totally versatile recipe, please do not compromise on this one step: you must Must MUST rinse the quinoa, or it will be oh so bitter. 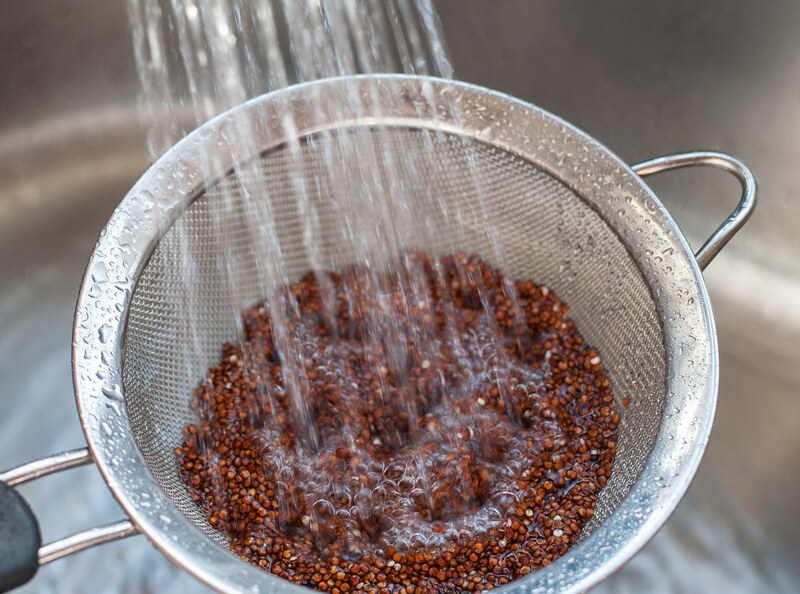 I’ve found the best way is to do this in a fine mesh strainer, and while it looks like the quinoa will fall through the holes, mine doesn’t. Test that theory with a small amount of quinoa if you’re worried, because lining the strainer with a paper towel, as I used to do, yields quinoa littered countertops and floors when you try to shake it free from the sticky, wet towel. Whether you make this meatless or use your favorite sausage, it's packed with tons of flavor (and protein). You can also keep it nut free or dairy free, if need be. Preheat oven to 450 (F). Wash and dry squash, halve lengthwise, scoop out seeds, and brush cut sides and cavities generously with melted butter. Season liberally with salt and pepper, and place face down on a rimmed sheet pan. Add 1 tablespoon water to the pan and bake 30 minutes, until easily pierced with a paring knife and the skin is beginning to wrinkle. While squash roast, prepare stuffing. Add pancetta to medium saucepan and turn to medium low heat, stirring occasionally until almost all fat has rendered, about 20 minutes. While pancetta cooks, heat 1 teaspoon olive oil in a small nonstick or cast iron skillet. Add crumbled sausage (see note), and cook until browned, 5 to 7 minutes. Remove to a bowl and set aside. When pancetta is done, remove to the same bowl as sausage using a slotted spoon, leaving as much fat in the pan as possible. Return pancetta fat to medium high, and add a little olive oil if the pan looks dry. Add carrots, celery, shallot, and ½ t salt, and cook until softened, about 5 minutes (any liquid should be evaporated). Add quinoa and cook, stirring constantly, about a minute, to toast and prevent clumping while it cooks. Add broth, thyme bundle, and ¼ t salt. Bring to a boil, then simmer for about 20 minutes, uncovered, until fully cooked. Turn off heat and remove thyme bundle. Add sage, sausage and pancetta, dried oregano, capers, balsamic vinegar, pine nuts, most of the parmesan, ½ teaspoon salt, and pepper (seasoning to taste). Stir until well mixed. After squash are done, reduce oven temp to 375. 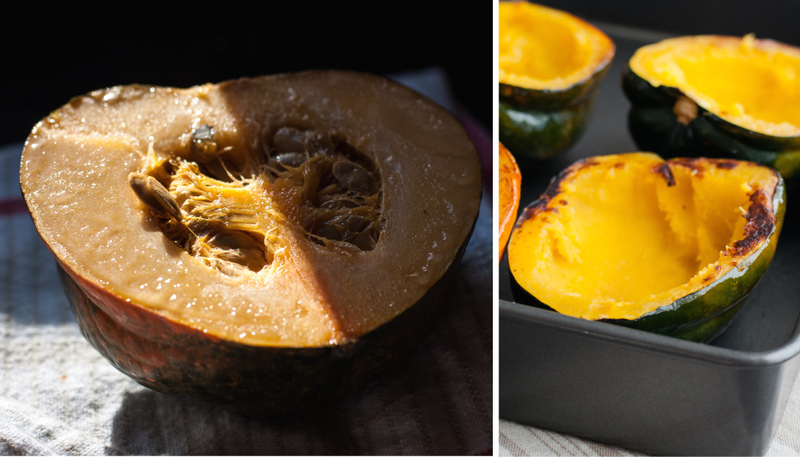 Turn the acorn squash halves cavity up and transfer to a deeper baking dish that will hold all the squash halves as snugly as possible. Use a spoon to carefully scoop out some of the squash flesh, leaving about ½" thick layer lining the skin. Set aside extra flesh for later use (see blog post for ideas). 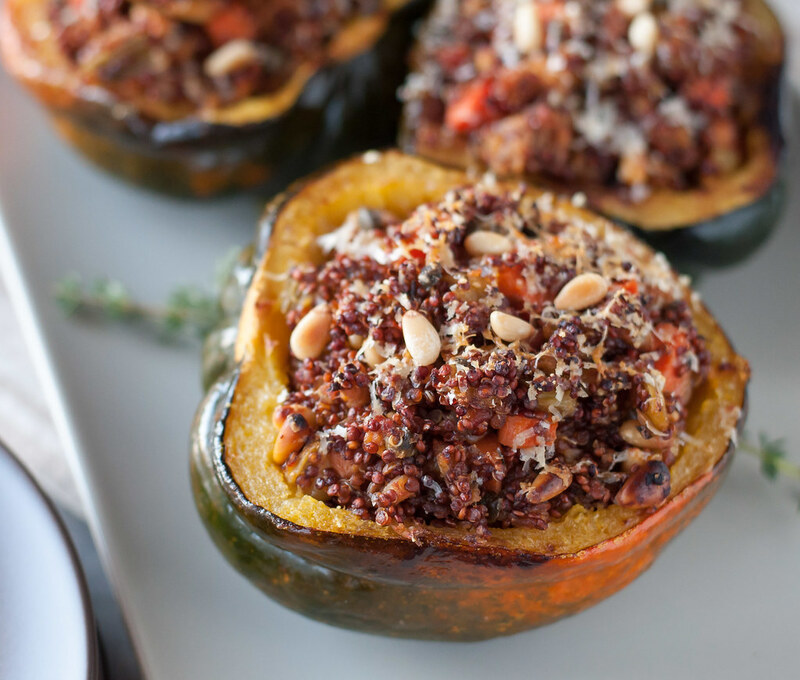 Spoon ¼ of the quinoa stuffing into each squash, pressing it down slightly so it doesn’t spill out. Bake about 15 minutes, until squash are very soft. To serve, sprinkle with grated parmesan. If using vegetarian sausages, crumble before adding to pan. If using chicken or other sausage with casing removed, add whole links to pan and break up as they cook. Don’t use pre-cooked meat sausage—it won’t crumble.